Help the Planet, Bring Joy to Your Life (Part 1) - Perelandra Ltd.
Are you as tired of the doom and gloom as we are? The events playing out before us have been stressful and prolonged. It's understandable that most of us want to hibernate and not come out until the craziness, bitterness and unproductive battles have somehow burned out or resolved. To change anything, we can't hibernate. We can turn our focus to positive, encouraging and, yes, enjoyable actions. We can make a difference in a way that gives us a break from all the noise and contributes to a stronger, healthier home, community and planet. You have to live pretty deep in a cave to miss the ever-more disturbing news about how climate change is impacting our environments. No matter where you live, it's darn impossible to ignore how the climate has changed in your own backyard. Flooding, drought, fires, hurricanes, earthquakes, deeper freezes, hotter summers, pollinator disappearance, insect explosions, algae blooms . . . We no longer have the luxury of trial and error attempts at finding solutions. The hope, a way to put joy in our days and find the answers we need is right there waiting for us to ask. Anyone can ask questions and get the help needed. Nature has solutions. To change this environmental trajectory fast enough, we have to ask for nature’s help, listen carefully and act. You are thoroughly inspired by Pivot and ready to move forward with your life, and develop your partnership with nature. Your lightly landscaped yard or your three prized fruit trees were destroyed by a hurricane last year, or maybe your vegetable garden was ruined by too much rain, or you are suddenly dealing with serious consistent drought conditions that used to be rare for your location. You are ready to give up and move into a condo. You love working outside, it rejuvenates you and brings you joy. 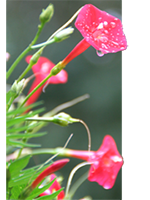 But last summer, an overabundance of mosquitoes and gnats kept you from spending any time in your gardens. You've fantasized about having a garden and growing your own food, but haven't the slightest idea where to begin. You don't have a yard or a garden or even a potted plant, but you keep reading depressing reports about our environment and feel completely overwhelmed, wonder if your efforts to reduce, reuse, recycle are too small to matter. You've been a farmer your whole life, thought at this point you had things figured out, but the last few years . . . All the variables have changed and what used to be a sure success no longer works. This winter, consider that it might be time to try something outrageous, adventurous and new to put a wonderful, practical, joyful break in your routine. Start a partnership with nature. Start a garden. Just a small, manageable something that reminds you not all of this world is crazy. Nature knows balance and nature is happy to share that balance. Begin your co-creative partnership. Or re-commit. There’s nothing to lose, and a whole new outlook and appreciation to gain. When you take 30 minutes or an hour each week to focus on your partnership with nature, you will take yourself out of the melee (or s#*!storm as some of us call it) and put yourself in a place that strengthens and puts right a crooked world. Who doesn’t want a little of that? Let's help turn this man-made disaster around. Let’s brighten life with a break from human-think. Spend time with nature. Start your conversation with nature right there at your kitchen table. Given the weather this weekend in most of the U.S., anything we can do without leaving home sounds great! First, you'll need The Perelandra Garden Workbook. Want to get started today and don't have the Workbook? Get the ebook edition now. Go get it off the shelf, dust it and crack it open. Let's get going. Once a week over the next several months, we'll help you through one easy step to working this partnership and creating a balanced garden. Your garden can be a few potted plants, a family vegetable plot, a small landscaped sitting area, a field for grazing sheep, a pond, a chicken yard . . . If you're a farmer, you can start with one small part of your farm. 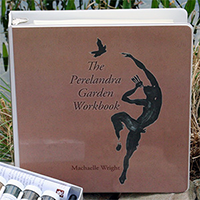 Machaelle takes you smoothly through each step in the Garden Workbook. Still, a whole book can seem daunting when learning something new, so we're going to walk with you in this series, one small, manageable step at a time. With each step, you'll often read just a paragraph or a page, sometimes a few pages. Follow along and when spring arrives, you're going to be surprised how ready and excited you are to put your garden pieces in place. Still, just one bit at a time. This won't take long. Sit down with your Garden Workbook, a pen and paper, or your tablet/laptop. Today you are going to start your partnership with nature. 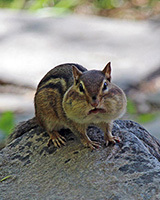 If this is your first time working with nature, you are going to activate a Gut Garden. 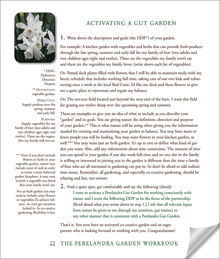 Follow the steps below for "Gut Gardeners." If you already have a Gut Garden, have learned PKTT (kinesiology testing) and want to move on to Gardening 2.0, or if you know PKTT and want to jump straight into 2.0, follow the steps below for "2.0 Gardeners." Nature won't judge! Start in your comfort zone so you all enjoy the partnership. You have only one page to read, and just two steps to do! Open The Perelandra Garden Workbook to page 22 and read it. To continue Gut Gardening, first re-read your DDP from last year. If your DDP still holds true for you, simply hit the start button and tell nature you're ready to move forward with this year's garden. If you would like to amend your DDP, write that first. Then hit the start button, tell nature you'd like to change your garden DDP and re-read the statements on page 22, Step 2, inserting your new DDP. When you're ready to change to Co-Creative Gardening 2.0, see pages 71 to 72. You have two pages to read. That's it. Two pages, five steps. Open the Garden Workbook to page 71. Read through Step 5 on page 73. Re-read your DDP from last year. If there are no changes to your DDP, all you need to do this week is hit the start button and tell nature you're ready to move forward with this year's garden. If you'd like to amend your DDP, do that in writing first, for clarity. Then, hit the start button and tell nature you'd like to continue your partnership and co-creative gardening, but you'd like to amend your DDP. 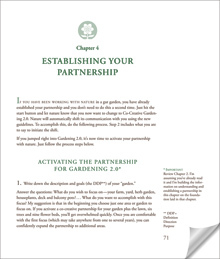 On page 72, Step 2, start with: "I want the following DDP to be the focus of the partnership . . . " In Step 3, ask, "Is my new DDP activated?" and continue through step 5. When you write your DDP, include a note that you would like climate change to be taken into consideration in your garden. Although nature will automatically adjust for climate changes in the information given to you, it's helpful for you to remember this is part of your work together. When you finish, close the Workbook and treat yourself to a cup of hot cocoa. You're a co-creative gardener! Meet us back here next week for your second gardening session. Remember, every "small" contribution we make to support balance in our own little part of the world contributes in turn to the larger world around us, and the planet. We’re grateful to have each and every one of you with us. Anytime you feel overwhelmed or get stuck, call our Question Hot Line. We will encourage you, get you unstuck and help you keep it manageable and simple.